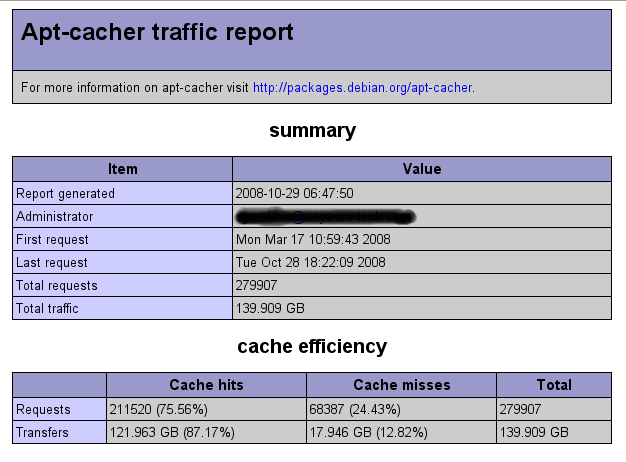 At work we started to use apt-cacher few days before Ubuntu 8.04 (Hardy) release. I previously explained the setup in this blog. Ubuntu 8.10 (Intrepid) is about to be released, it’s time to do a review of how things have gone during the last six months. Figures: you can find attached to this post a screenshot of our report page (you can get a similar page on http://your_cacher:3142/report.html). As you can see, we have avoided around 140 MB. We have around 40 servers running Ubuntu and around 40 desktops/laptops running diffent Ubuntu flavours (Ubuntu/Kubuntu/Xubuntu). Feeling: More than figures, apt-cacher is a nice tool to use: you do not wait anymore your downloads. It’s often in the local cache. Applying kernel security update does not mean anymore to wait for downloads. You downlard your kernel around 30MB/s! We have no regrets in the short time investment we made on installing and configuring this tool. We may have a look in the future on apt-cacher-ng, but now, everything is running well.